Anne Dyjak, PCDC’s managing director of capital investments, is campaigning to bring her vision for healthier and more equitable communities to the board of the Opportunity Finance Network (OFN). A leading voice of the growing mission-focused opportunity finance industry, OFN is a national network of community development financial institutions (CDFIs) investing in opportunities that benefit low-income, low-wealth, and other disinvested communities in the United States. Member organizations will consider a slate of candidates including Anne to help lead the network at OFN’s annual meeting and conference in Washington, D.C. this September. Watch Anne’s campaign video and learn more about her candidacy below! Vote for Anne – and for healthy, thriving communities – at the OFN Membership Meeting on Thursday, September 28, from 8:45 AM–10:15 AM. Can’t make the meeting? Contact OFN to vote by proxy. Anne Dyjak Candidate Video from Opportunity Finance Network on Vimeo. 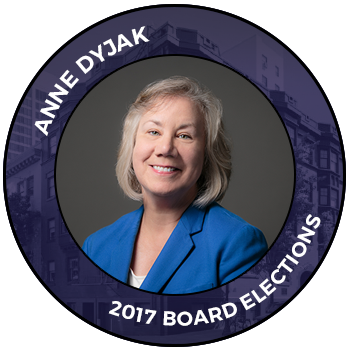 I am Anne Dyjak and I humbly request your support of my candidacy for the OFN Board. I am the Managing Director of Capital Investments at Primary Care Development Corporation (more commonly known as PCDC). PCDC is a national non-profit community development loan fund committed to catalyzing healthy thriving communities in underserved areas with a 25 year history of capital investment, capacity building technical assistance and advocacy. PCDC has over $200 million in portfolio under management comprised of loan, NMTC and bond financing primarily to community health centers. PCDC has been a member of OFN since 2001 and has been Aeris rated since 2005. I am passionate about social justice and have been active in community service throughout my life, serving on various non-profit boards and leading a Sierra Club program that provides outdoor adventures for urban youth. I pursued a transition to the CDFI industry twelve years ago after a career in traditional financial services so that I could contribute my skills and experience and gain the personal and professional satisfaction of benefiting the greater good. Throughout my career I have had the opportunity to work with a wide array of organizations in urban and rural communities – ranging from homebuyers to small business owners to commercial real estate developers – providing financing for working capital purposes to facility projects, including single family homes, mixed use retail, schools, and health centers. I have first-hand experience working with the diverse clients OFN’s membership serves and over the past 12 years I have had the pleasure of partnering with many talented CDFI’s across the country. I believe in a society of equity and inclusion, where everyone deserves access to jobs which pay a living wage, safe affordable housing, education, healthy foods, and high quality health care. We are at a critical time in this country where our commitment, talents, and resources are needed now more than ever before to preserve and expand access to critical, safety-net resources and services for those most in need. I believe there is incredible opportunity before us in the CDFI industry to mobilize, collaborate, and advocate to support and transform peoples’ lives in low income communities to help build and develop equitable, healthy, thriving communities. I fully support OFN’s mission of leading and supporting CDFIs and our partners to ensure that underserved people and communities have access to responsible, affordable capital and services. I would be honored to serve as an ambassador for you, OFN and our industry – advocating for resources, increasing recognition of the transformative work we do, seeking ways to strengthen our industry – advancing the goal of aligning capital with social, economic, and political justice. I ask for your support to represent you, the OFN membership, and the communities we serve on the OFN board. housing, education, healthy foods, and high-quality health care. What do you think is the most important role for OFN in the CDFI industry right now? may be successful and flourish in healthy, vibrant communities. What will you bring to the OFN Board during the next three years?